If Ireland go on to win the Grand Slam, or Championship, or both, the telling of the story will rev up around the last few minutes of their opening game in Paris. Staring defeat in the face they somehow managed to defy time and logic and work their way through some 41 phases for Johnny Sexton to drop a goal from 42 metres to win the game. 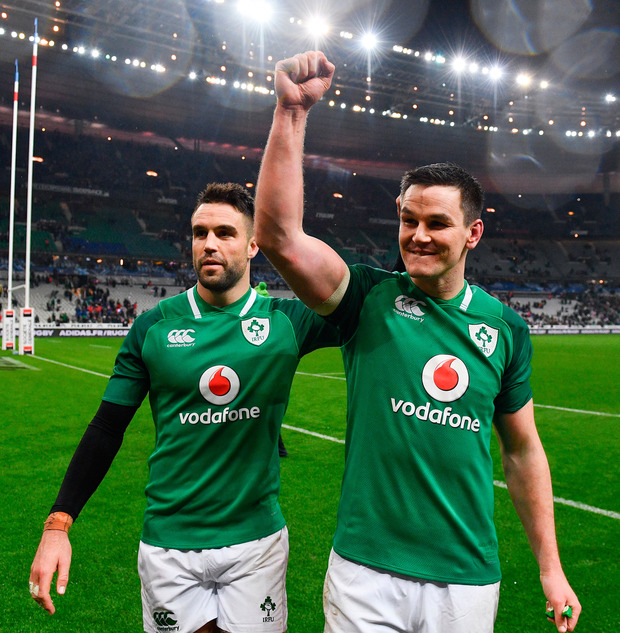 "It's pretty hard to explain how you feel when you think that the game has got away and you've let it slip and suddenly you've grabbed it because of an incredible team effort," Joe Schmidt said afterwards. "To work their way up the pitch - about 45 metres - and then to add on to the end of it a 42-metre drop goal, it was I think fairly inspirational. Even the fact that so many people had to be involved. "When he struck the drop goal I was just willing it to have enough distance to get over because when he struck it - it looked like it might (carry). And when it did the coaching staff all stood up as one and cheered with the other Irish supporters who were in the stadium." Had Ireland lost - which seemed entirely likely until that remarkable finish - the coach would have been explaining how with virtually every metric in their favour they had allowed France to steal it at the end - through a brilliant individual effort from Teddy Thomas. "We (would have) felt it was one that got away - if it did manage to get away," Schmidt said. "I felt we did a lot of things really well. We started the game really strongly, right from the first phase of play. It was a stop-start game, there were lots of penalties and then lots of potential penalties that caused some very slow ball. If you try and break a French defence down with slow ball, even in those last phases of play there were some rucks that were seven/eight seconds, you're really up against it because physically in getting off the line you know how tough they are. "I think people maybe underestimate how hard it is to come here and win. Having metrics in your favour doesn't necessarily give you the metric that you want, which is the 15-13 at the end." The full cost of the effort will become clear over the next 24 hours, but Josh van der Flier is already out of the Italy game in the Aviva on Saturday. He suffered a medial knee ligament injury and will be scanned as soon as is practicable. Already in the Championship race Scotland's November form has been seen to be misleading as they were blitzed in Cardiff by Wales, while England take on Italy this afternoon in Rome.